I realised the other day that it has been far to long since my last post. Months in fact! 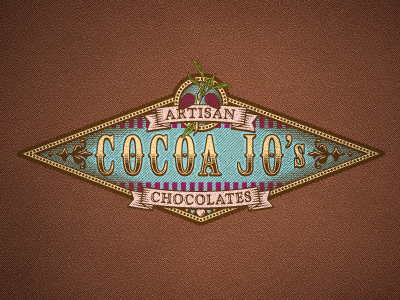 So if you can bare with me I will show you the great changes Cocoa Jo’s has been making and creating. First off, I cannot wait to show you this any longer. I was going to wait until we had time to change the website but Im too excited. We had an amazingly talented designer, Matt from VERG create my new and final logo. To say I love it is an understatement!!! Matt did an incredible job and it is so much more than I could have ever dreamt of. If you know me at all you will know this suits me to a tee. Now over time I will start to change the packaging and promotion materials with my logo and maybe even get some shirts and aprons made up to sell, if anyone is interested? 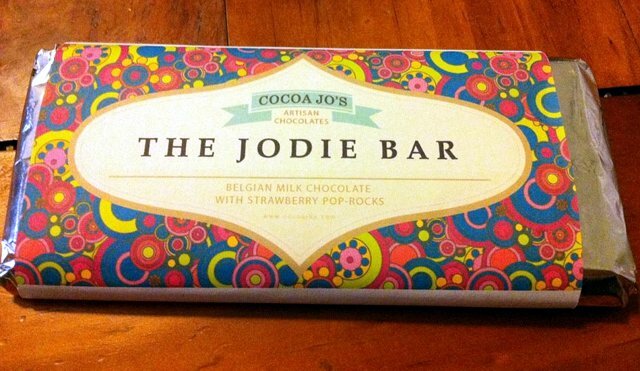 I have been busy making and selling personalised chocolate bars and have even got a wedding order for them. Which I am completely excited about. 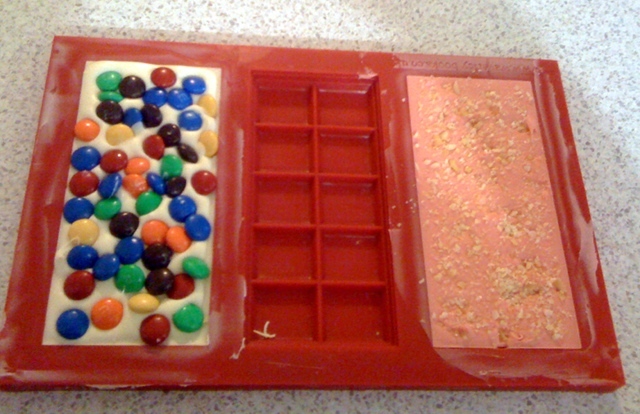 The most popular flavour so far has been the white chocolate and strawberry poprocks. 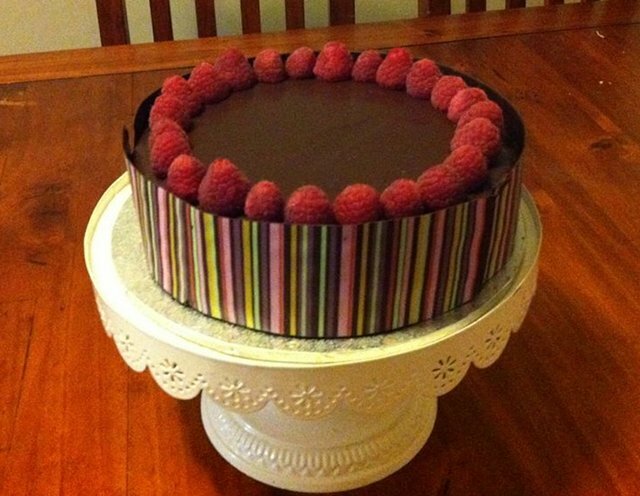 I made a chocolate and raspberry mousse torte for a dear friends birthday. 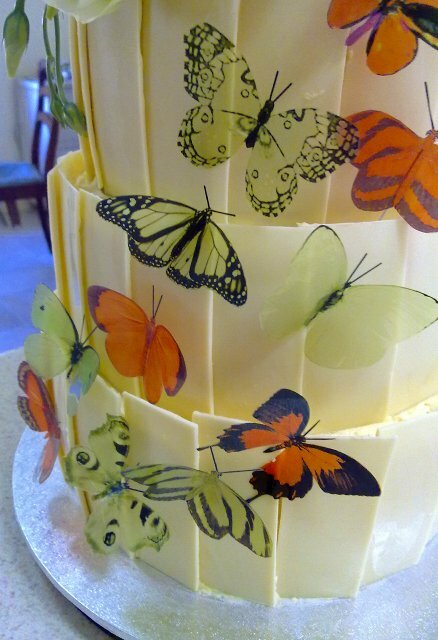 It turned out lovely and has now been added to the future cafe cakes list. 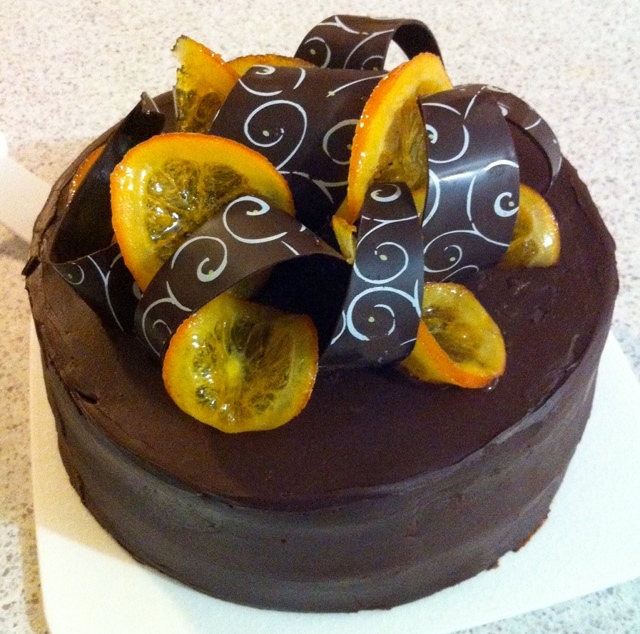 Talking about birthdays, I had an order for any cake as long as it was gluten free….I made an orange and almond cake with orange chocolate ganache, chocolate curls and confit oranges. Wow! 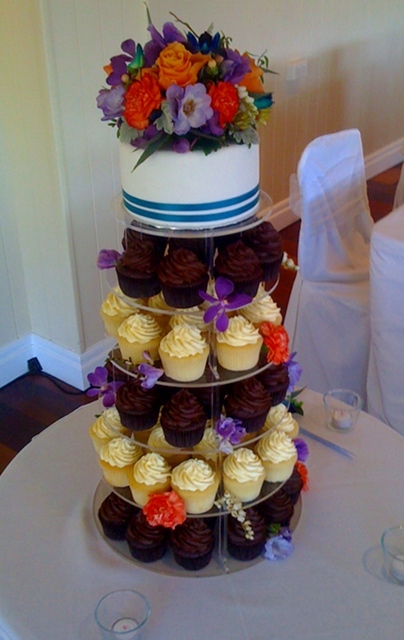 There is a lot to show you….. My next order was for an extravagant dessert tower for 40 people. I absolutely loved doing this and think this will be what I will do for our next big dinner party. 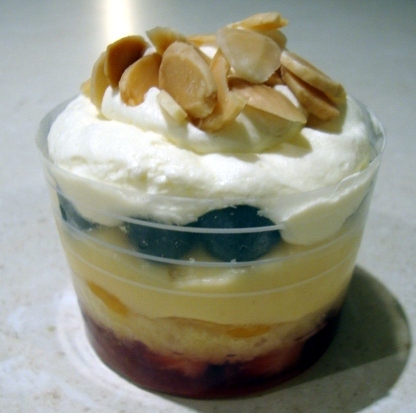 There where four different flavoured desserts in individual cupcake sized cups. 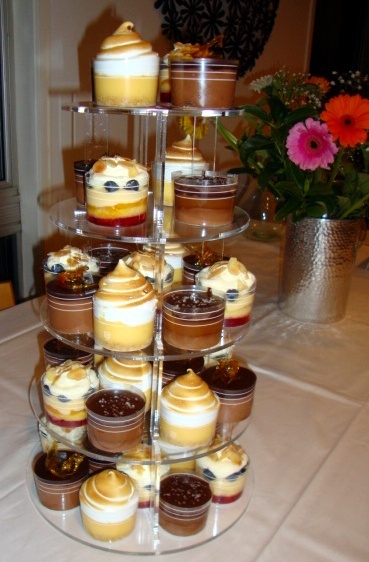 Lemon Meringue, Chocolate Salted Caramel Parfait, Trifles and Chocolate Mousse Tortes. 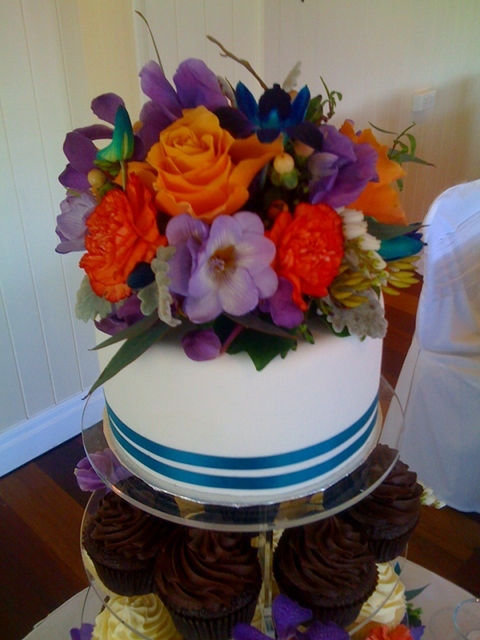 I received rave reviews for this order, even from the General Manager of one of the top hotels in Brisbane.. He thought they were incredible!…I was blown away by his comments. 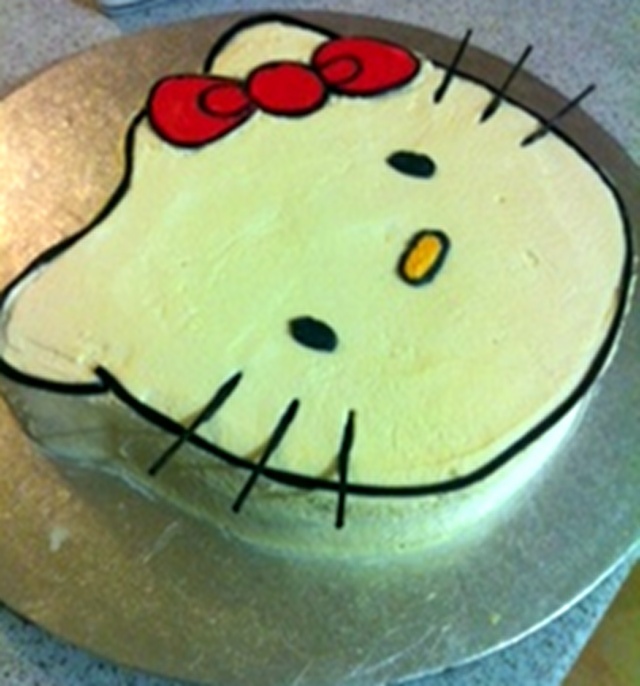 Next I had a cute little Hello Kitty cake for sweet Emily. Vanilla Cake with Vanilla Buttercream frosting. 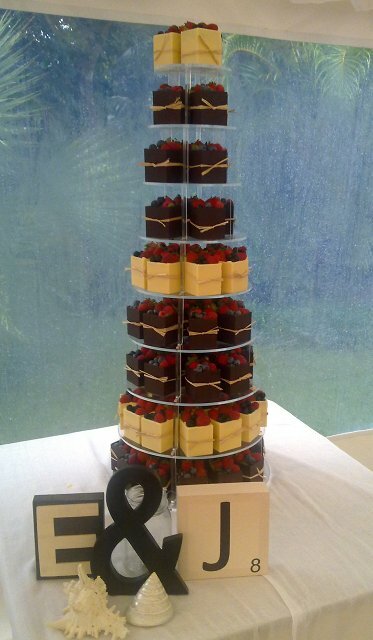 And finally… on Fathers day I had to deliver and set up a wedding cake tower for a lovely couple. 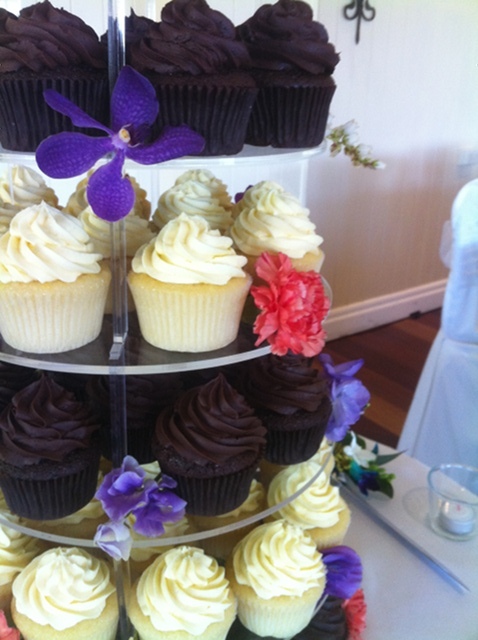 The top cake was a Chocolate whisky fruit cake and the two cupcake flavours where my classic chocolate on chocolate and vanilla cupcakes with passionfruit butter cream. 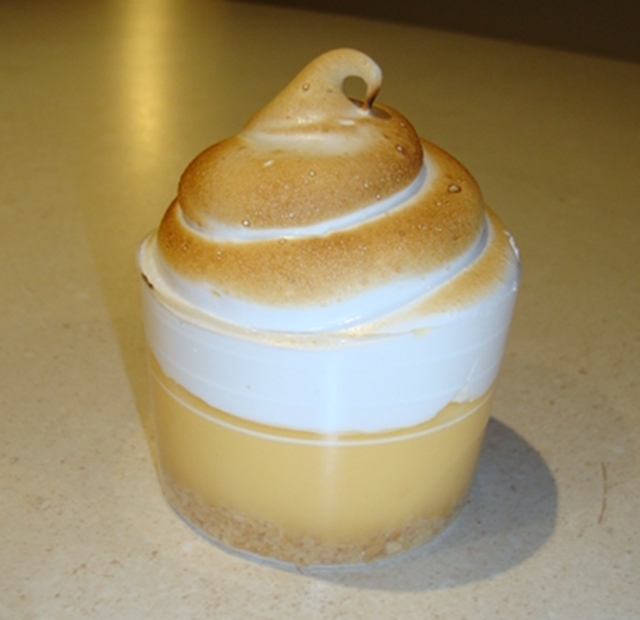 If you have never tried passionfruit butter cream…. 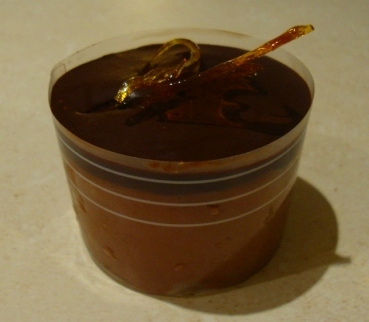 whip some up today… just replace the milk in your icing mixture for passionfruit… Its so divine!. Well thats it for now… Thanks for hanging in for the LONG post….. see you soon with my next exciting orders I’m currently in the process of creating! 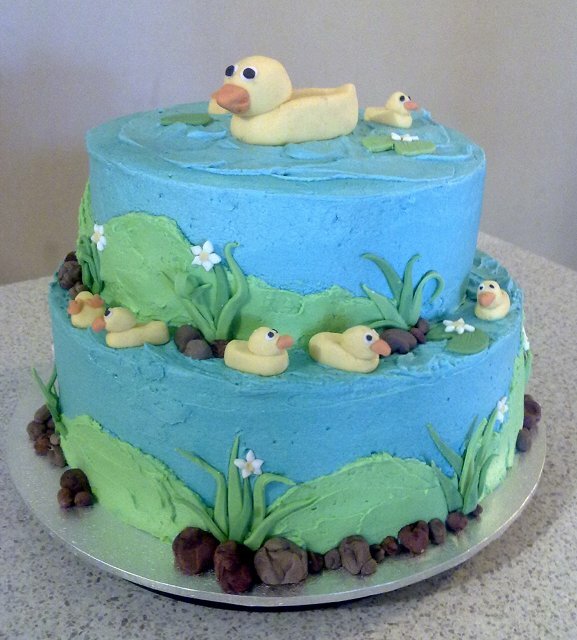 and a duck pond for 1 year old Lewy. Lots of fun. 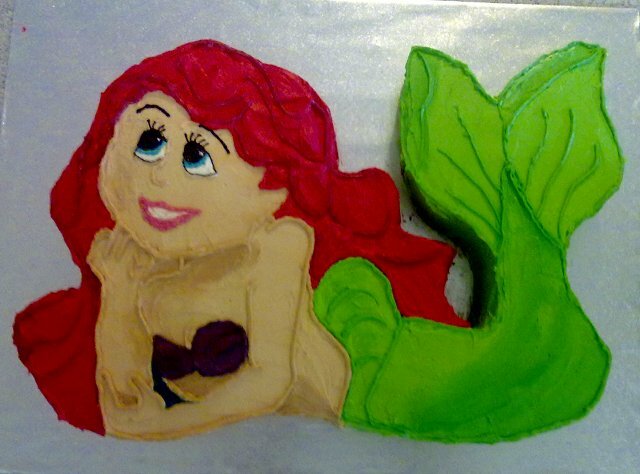 This morning I recieved a phone call from a friend to say the childs’ birthday party she was attending was now ‘cakeless’…..due a disappearing baker! 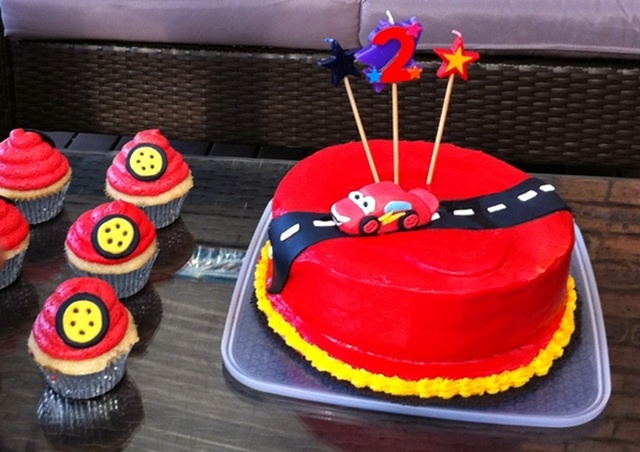 So the challenge was… could I bake a cake and cupcakes with the cars theme in 3.5 hours? Well I have to say both yes and no…..haha.. I made the cakes and cupcakes but unfortunately no matter what I did I couldn’t cool the center of the cake down enough. I ended up frosting it anyway and if you look real close it was melted by the time they had traveled the hour drive to deliver it. 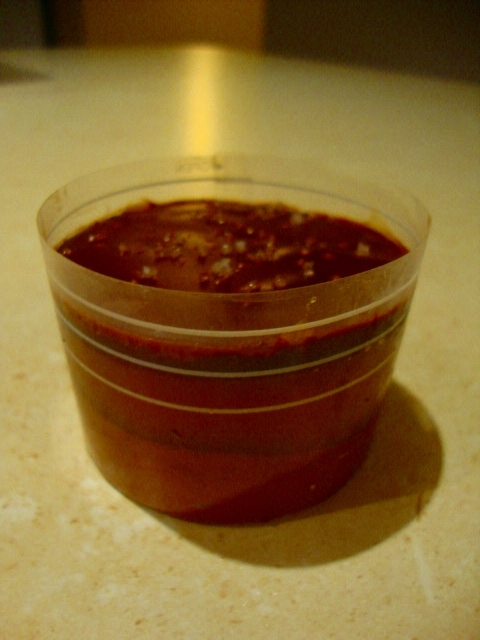 But all in all the reports on taste were good and the parents of the birthday boy were very happy with it. Maybe I need to invest in a blast chiller like the ones on Masterchef. I was happy enough with it and so were the customers, considering all that happened. 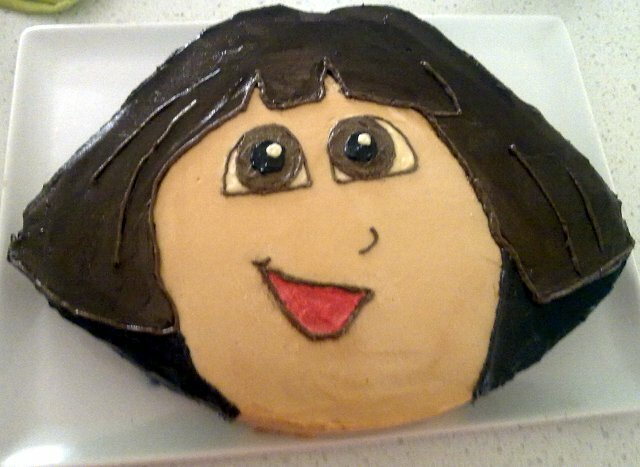 This weekend we celebrated my mother’s 60th birthday and she asked me to make her cake. Which of course I was delighted to do. 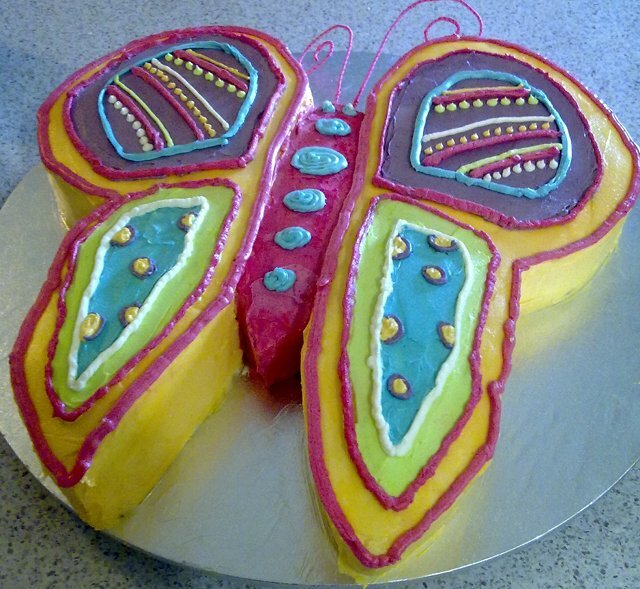 I was very excited with this cake as I had free reign to decide what to make. I ended up baking a 3 tier vanilla syrup cake with two butter cream layers, both vanilla bean and raspberry. 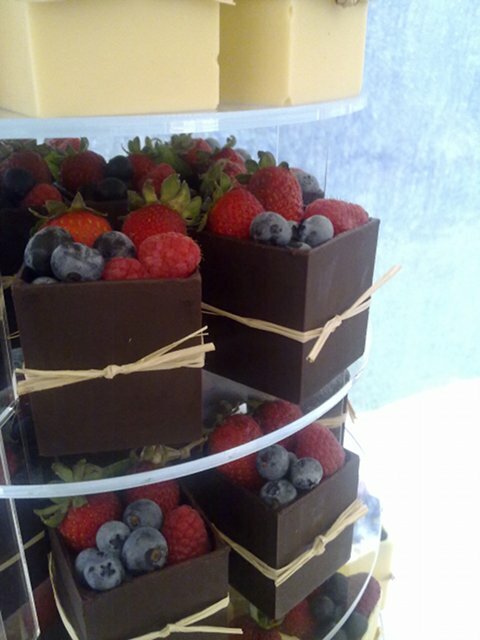 Each tier was surrounded by panels of white Belgium chocolate. 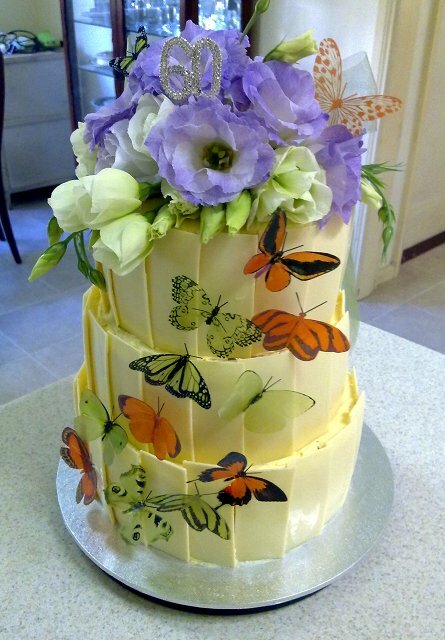 I finished the cake with fresh flowers and acetate butterflies.